The actual implementation assigns weights to the possible matches, meaning that matching 1 item would be preferred, but if it results in a dead end it tries the next match. I feel like there is a better implementation of this out there, maybe involving sets to find where items overlap and determining the critical path. I just haven't been able to come up with a decent alternative other than this exhaustive search. After researching the algorithms suggested in the answers I decided to go with the munkres algorithm. It allows weighting of items in the vertex. The problem you're trying to solve here is to find a maximum matching in an unweighted bipartite graph. 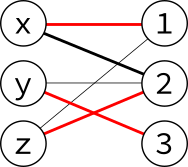 This can be solved in \$O(\sqrt V E)\$ by the Hopcroft–Karp algorithm. Now there are no more augmenting paths (because there are no unmatched vertices in \$U\$) and we are done. Using this structure, an augmenting path can be found efficiently (linear time) by a depth-first search that only follows edges from lower-numbered layers to higher-numbered layers. This is a direct translation of the pseudocode from Wikipedia into Python. To help with book-keeping, this implementation introduces a distinguished node nil, with all vertices being artificially matched with nil to start with. When there are no more augmenting paths ending at nil then we know the matching is maximal. 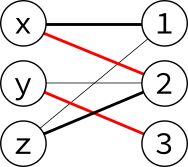 vertices in one partition to their matched vertex in the other. # The two partitions of the graph. # A distinguished vertex not belonging to the graph. # Current pairing for vertices in each partition. # Distance to each vertex along augmenting paths. # layers according to their distance along augmenting paths. 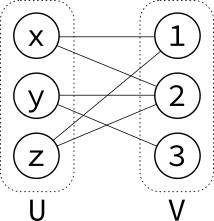 # Follow edges from U->V not in the matching. # Follow edge from V->U in the matching, if any. # (since the path must have an odd number of edges). # swapping v must now be matched with u.